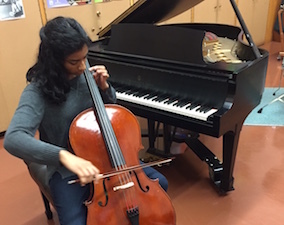 Nithya Attipetty, a sophomore cellist at Prairie, was recently named Principal Cello in the Milwaukee Youth Symphony Orchestra Philharmonia. Attipetty earned the spot after a seating audition with MYSO in August. The Philharmonia is MYSO’s third full symphony orchestra. The 130-member group is comprised mainly of students in grades 7-11 and participates in a curriculum that introduces the major styles of symphonic literature. Attipetty started learning music at The String Academy of Wisconsin at five-years-old. In addition to performing for Prairie, she also studies with Ingrid Thitcheha.